Memorandum submitted to Mr. U.T. Khader, Minister of Urban Development & Housing, Karnataka; Mr. R. Sampath Raj, Mayor of Bengaluru; Ms. Sowmya Reddy, Member of Legislative Assembly, Karnataka, representing Jayanagara; Mr. Manjunath Prasad, Commissioner of Bengaluru. 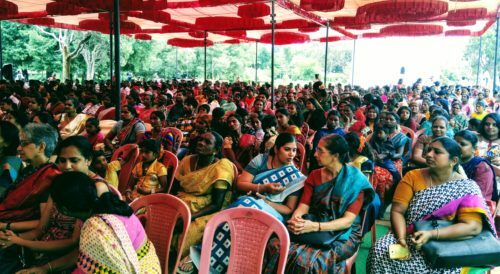 The memorandum was submitted on the occasion of Hasiru Habba, an annual gathering of waste-pickers in Karnataka, where more than a thousand waste-pickers participated. 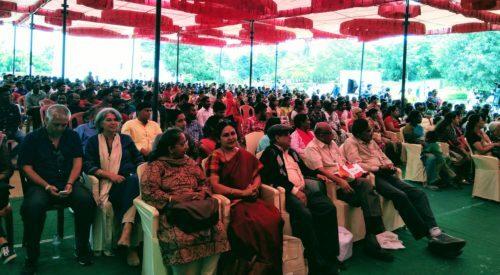 The gathering is organised to celebrate the work done by waste-pickers and informal waste collectors to keep our cities clean and healthy. Waste pickers and informal waste collectors of Bengaluru, with the support of government officials and citizens have transformed the landscape of waste management in the city. The city has scientific decentralized inclusive waste management systems in place. Waste-pickers and informal waste collectors are back-bone of that system. They help the Bengaluru municipal body save more than INR 84 crore annually by diverting 1050 tons of waste to recycling. Further, due to their inclusion in dry waste collection and aggregation. They have sent more than 7144 tons of dry waste for recycling and co-processing. In the past two years, waste-pickers have been recognized as important stakeholders in the Solid Waste Management Rules 2016 and Swachh Bharat Abhiyaan. Bruhat Bengaluru Mahanagara Pallike (BBMP), Mysore, Tumkur, Chamrajnagar, Nelamangala and Nanjangud Municipal Corporations have issued occupational identity cards to waste-pickers and included them in the solid waste management system. The various departments in the union and municipal governments are helping this movement through the skill up-gradation to ensure livelihood security. That said, waste-pickers are a vulnerable social group. They have meagre incomes, no social or livelihood security, and terrible housing arrangement. This is the worst for migrant waste-pickers, who have come to Bangalore after leaving rural distress and disasters like floods and droughts behind. The migrant waste-pickers are looked at with suspicion and harassed by various authorities. They are excluded from all social welfare measures. This is gross violation of fundamental rights. The constitution of India guarantees ‘Right to migrate’ as a fundamental right in Article 19 (d, e, g). Continuation of enumeration of waste-pickers and issuance of occupational identity cards to waste-pickers in all cities of Karnataka. The process needs to be re-initiated in Bengaluru, as BBMP has stopped issuing the occupational identity cards. Inclusion of waste-pickers representatives in all committees from Municipal, Gram Panchayat level to State level formed to formulate plans for solid waste management and monitoring their progress. This is prescribed in Solid Waste Management Rules 2016. Karnataka Government has dedicated 500 houses for wastepickers and we would like the eligibility criteria should be relaxed. The wastepickers who have lived in city for decades and have received occupational ID cards recently are considered for the housing. Some of the wastepickers who have public housing needs their homes to be repaired and upgraded to avoid flooding in their homes in the next rains. We would like the government to float a scheme for loans with lower interest rate. Hasiru Dala is experimenting with upgrading and building homes by using construction debris. We would like the government to approve and give loans for such up gradation. Enumeration of migrant waste-pickers and issuance of occupational identity cards to them. Extending access to food through public distribution system as has been promised in the Congress party manifesto. Allocating budget for training and skill upgradation of waste-pickers and informal waste collectors as has been mandated by Solid Waste Management Rules 2016. Children of waste pickers are one of the most marginalized children in the urban landscape. Their future is severely affected by not having safe and stable housing and access to basic resources like water and electricity. Our children’s program- Buguri Community Library works with children of waste collectors through a library program in their community and understands the day to day struggles of children. With parents both at work, it becomes their responsibility to fend for these basic needs. 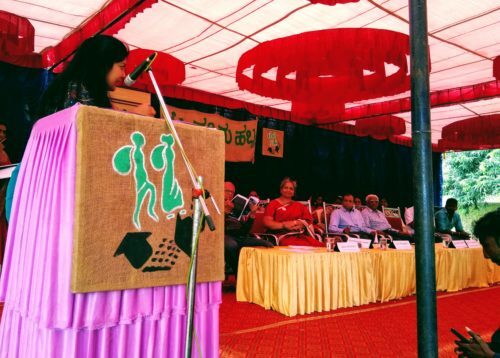 This severely hampers their education and their access to a hygienic environment. We would like that every housing facility constructed by the government provides the basic services of water and electricity. We look forward to your continued support in our struggle and we hope that you would champion our cause at the municipal and state level to bring the changes that we aspire for.